NAIROBI , May 22 2013 (IPS) - Amid warnings that Kenya’s agricultural water use is surpassing sustainable levels and adversely affecting food security, biodiversity researchers say that agrobiodiversity should be considered as a vital tool to combat this. “In order to feed the nation, the country must explore agrobiodiversity, specifically (the growing of) vegetables and fruits, which have been neglected in favour of maize,” Mary Abukutsa-Onyango, a professor of horticulture at the Jomo Kenyatta University of Agriculture and Technology, told IPS. As climate change continues to wreak havoc on rainfall patterns, resulting in intermittent prolonged dry spells across this East African nation, vegetables present the best alternative to maize because they do not require large amounts of water. According to the United States Agency for International Development Kenya, this nation is “classified among the most water scarce countries in the world.” And government statistics indicate that 13 million Kenyans lack access to improved water supply. “In Kenya, and by extension Africa, desertification and water scarcity are a major threat to agriculture and to pastoralist communities. Strategies such as irrigation, water harvesting and conservation, and tree planting must be revamped,” Nashon Tado, of the Norwegian Refugee Council’s Horn of Africa and Yemen office, told IPS. 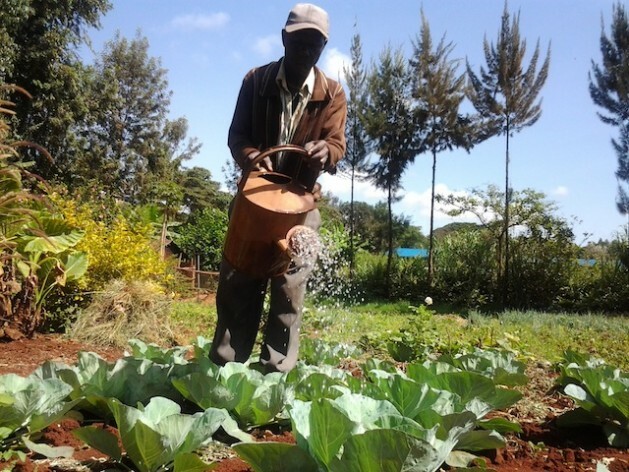 The Ministry of Agriculture says that at least 70 percent of Kenya’s agricultural production comes from smallholder farmers who farm on two to five acres of land. Of Kenya’s 42 million people, eight million households are involved in agriculture, with five million depending directly on it for their livelihoods. But Kenya’s Food Security Outlook 2013, released on May 15 by the U.N. World Food Programme, confirmed that embracing other crops besides maize was improving food security here. “Improved availability of green vegetables, green maize and legumes from early June through July is expected to diversify diets and sustain food consumption,” the report stated. It makes sense that Kenyans should explore biodiversity. Kenya has ratified the Convention on Biological Diversity, the globally negotiated agreement committed to sustainable use of biodiversity. Consequently, agrobiodiversity is being touted as a solution to the biting water stresses facing Kenya. “This year’s International Biodiversity Day’s theme is Water and Biodiversity and is very significant as the country tries to find innovative techniques and strategies to maximise water usage,” Naomi Chepkorir, an agricultural extension officer at the Ministry of Agriculture, in Kenya’s bread basket, Rift Valley province, told IPS. Indigenous vegetables and fruits are easy to manage, can withstand high and unpredictable temperatures, and are known to have high nutritional value and contain high concentrates of micronutrients, including iron. “Take the spider plant and African nightshade, which are found in parts of Western and Nyanza provinces, as well as across East Africa. They are known to be nutritious, medicinal and are very rich in iron, calcium, magnesium, anti-oxidants and fibre,” Abukutsa-Onyango said. The spider plant is known to have high levels of beta-carotene, calcium, protein, magnesium, iron and vitamin C. The plant is also high in antioxidants, which may help prevent diseases like diabetes, cancer and heart disease. Chepkorir said that generally vegetables have a shorter life cycle compared to other crops. They grow in a few weeks and require very little irrigation, hence allowing smallholder farmers to reap the benefits of their harvest earlier than they would if they planted a crop like maize – which takes up to three to four months to mature. Abukutsa-Onyango agreed, adding that indigenous vegetables are able to adapt to climate change because they mature faster. She gave the example of the spider plant and the variety of amaranth that is indigenous to Africa, which can be harvested within three weeks of planting. She added that the slenderleaf ice plant could also withstand water deficit conditions. Abukutsa-Onyango added that growing a diversity of indigenous vegetables and fruits “would not only address food security, but also nutrition and health security. “People should eat a balanced diet, and currently Kenyans are consuming inadequate amounts of vegetables and fruits leading to an upsurge of diet-related diseases,” she said. Good nutrition and healthy diets are important aspects in meeting the Millennium Development Goals (MDGs). The eight ambitious goals, adopted by all U.N. member states in 2000, aim to curb poverty, disease and gender inequality. Government statistics show that about 35 percent of Kenyan children suffer from malnutrition, including iron deficiency anaemia. But water is a significant aspect of food security and management of this resource requires cooperation from many levels, according to Phillip Muthee, from Kenya’s Private Sector Alliance (KEPSA). KEPSA is the umbrella body of organised business associations, ranging from big to small enterprises in the country. “When water is managed and shared cooperatively, it supports livelihoods, food security and the economy,” Muthee told IPS. Muthee feared that Kenya’s new devolved system of government could lead to potential new conflicts around the provision of and access to water. Kenya is now implementing the new system, which allows for decisions affecting Kenya’s 47 counties to be taken at grassroots, as opposed to national, level. “For instance, the government has already committed to make about one million hectares of land irrigable. But conflict may arise between the national and county governments regarding whose responsibility it is to ensure that this is done,” Muthee said.